If you have dry skin, moisturizers and lotions may help. But what you eat can also play an important role in keeping your skin healthy. 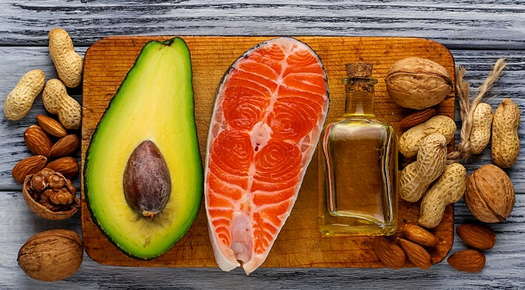 While sometimes we think fat is bad for us, certain fats are essential for healthy skin. Phospholipids, cholesterol, free fatty acids and ceramides all help to form the skin barrier. This keeps water from leaking out, and prevents your skin from becoming dehydrated. The body uses polyunsaturated fatty acids to make the lipids that keep the surface of the skin healthy. These naturally-occurring compounds can also reduce inflammation in irritated skin. Two “essential” fatty acids that are important for your skin — and heart — health include omega-3 and omega-6 fatty acids. The body cannot make these, so you have to get them from your diet. Vitamin C: Needed for the proper functioning of the enzyme that helps collagen form. Collagen is the component of skin that holds in moisture. Copper. Helps keep collagen denser so your skin stays hydrated. Zinc. Helps keep collagen denser so your skin stays hydrated. Also reduces inflammation in the body, which may keep your skin smoother. A well-balanced diet with lots of fresh fruits and vegetables should provide you with enough of all three of these. You can also take a daily multivitamin and mineral supplement. Caffeine. Caffeine may have a mild diuretic effect, meaning it will cause you to urinate, but it probably doesn’t increase dehydration. However, caffeine can cause the blood vessels to constrict, which may reduce the flow of blood and nutrients to your skin. This may worsen your dry skin, especially if you have poor circulation to begin with. Alcohol. Alcohol is a diuretic, but you would either need to drink a lot of alcohol or already be dehydrated to notice. Still, healthy skin depends on good overall health, so your best bet is to drink alcohol only in moderation. If you have dry skin, eating healthy can help give your skin a fighting chance. For more advice and tips on putting your best skin forward, including the best cleansers and moisturizers for dry skin, visit your skin care professional. Salon & Spa Savings . See More. Wednesday -Thursday 20% OFF Any 2 Hair Service. Buy Three 60 mins Swedish Massage$95. New Clients Receive 25% OFF. Book Now.